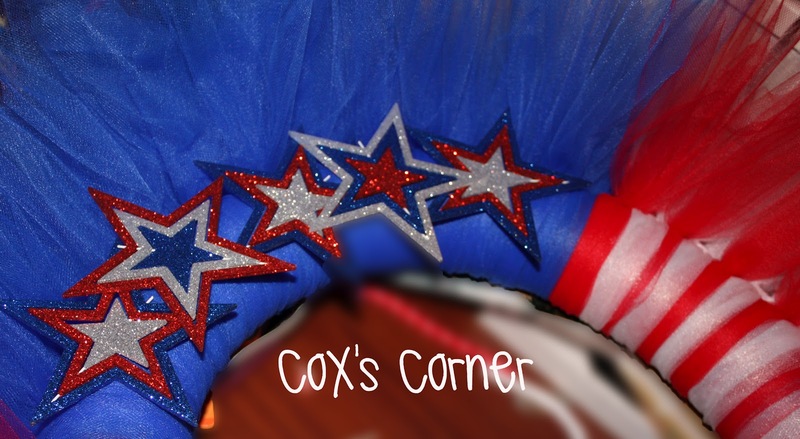 This is one of the #TBT posts from when my blog used to be Cox's Corner. 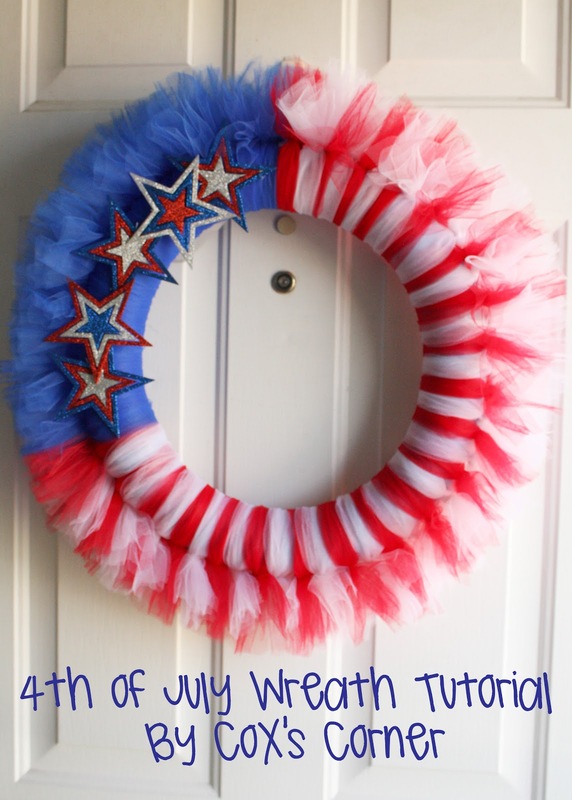 I STILL love this wreath so much and it has held up nicely for the last 3 years! 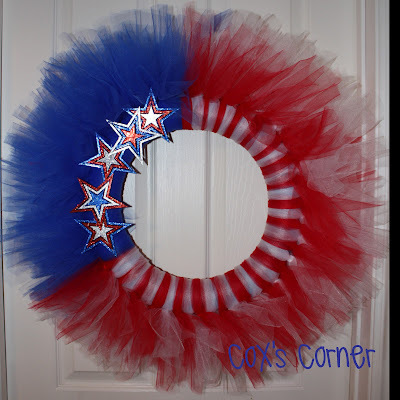 I had seen a wreath similar to this one all over pinterest. I believe the original source is here. 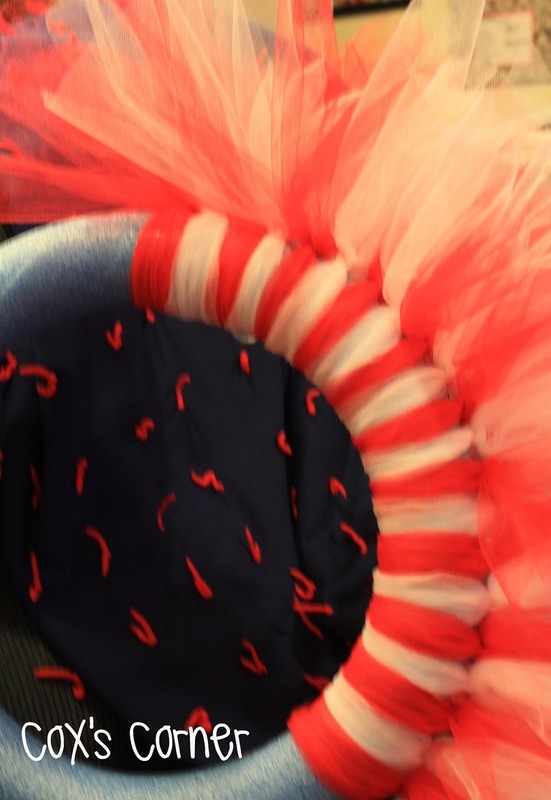 I didn't really like the tutorial because I was nervous about the way the tulle was tied that it would fall apart too easily! So I did my own thing and decided to share it with you! 9 to 11 inch piece of cardboard (depending on how long you want your tulle to stick out from the wreath. Wire cutters if your stars have wire sticks on them. 1. 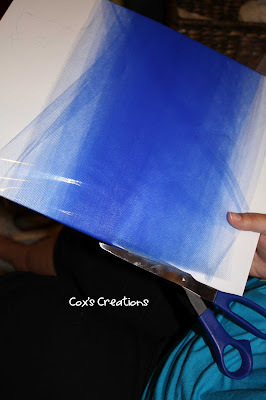 You will wrap your tulle around your piece of card board 66 times. 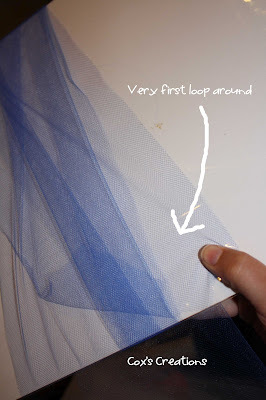 One time around is wrapping your tulle from the front all the way around the back. 66 times each color. This number depends on how large your wreath form is, if it's smaller than the diameter of a pool noodle, you will lessen that number. 2. Once you do your 66 loops around, you will cut on the edge that you started at. Cut there ONLY, otherwise your tulle will be too short! 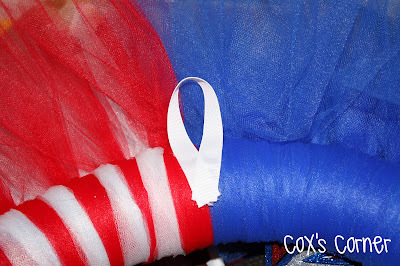 Please note my thumb, do you see the first layer of tulle sticking out? 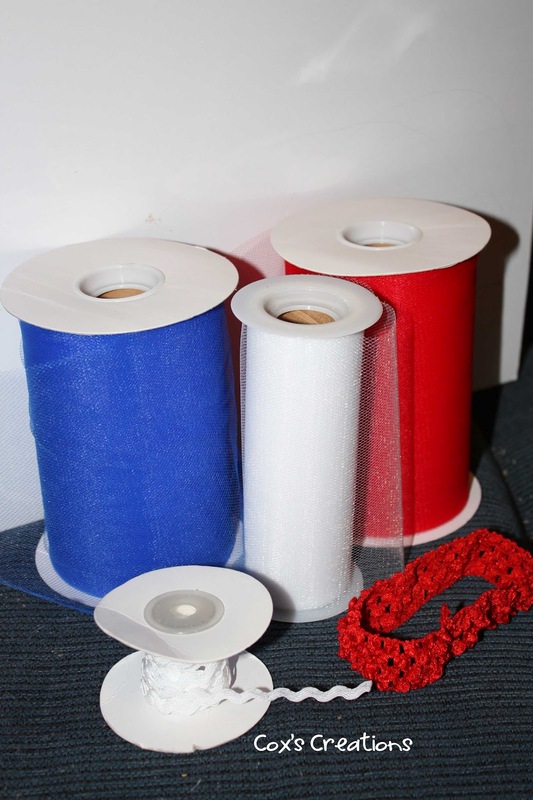 When you are finished looping and cutting, you will have three sets of 66 layers of tulle. Just set the blue aside, you will not need this until later. and ALL of your white strips are tied left over right, right over left. You dig? ALL of your red strips are tied right over left, left over right, and ALL of your white strips are tied left over right, right over left. You dig? By following this method you will achieve a much fuller wreath. As I tied my knots I made sure that they all lined up together and they were actually closer to the bath of the wreath form instead of directly in the middle. They were slightly off center. You can see in the picture below. 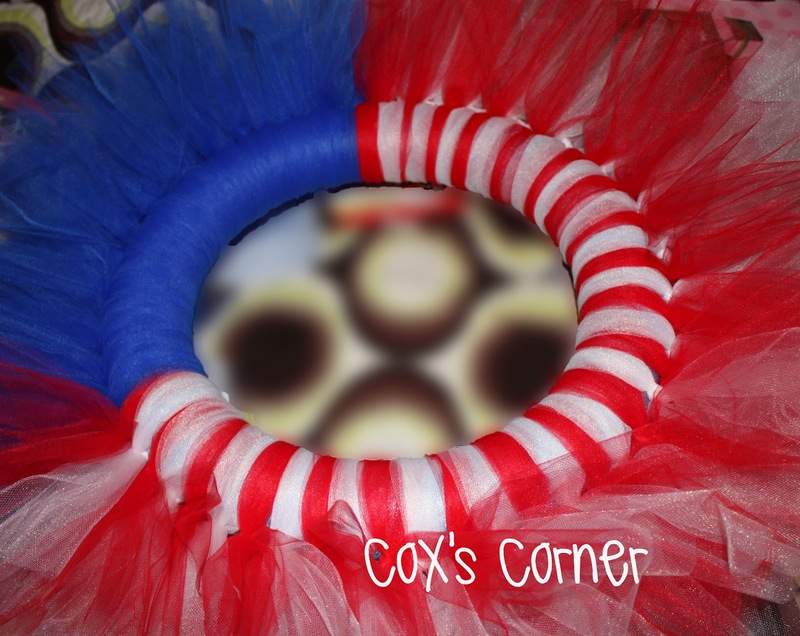 You can also spread out your tulle to make sure that it's covering your wreath form. This is how your wreath should look about halfway through. 5. 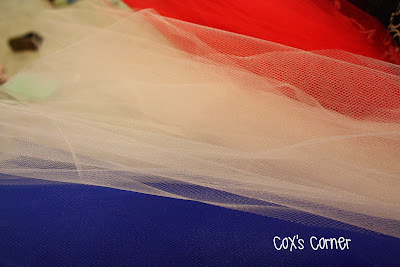 You will want to continue alternating your red and white tulle until you get to about 3/4 of the way around. I liked to fluff the tulle edges as I worked my way around. You can choose to leave it as is, or you can add some fun embelishments. I found these stars at our local Hobby Lobby, they were $1 each. They did sell some that were 3 for $1. But I liked the little extra these would add. If they have wire on them and you don't want to kill your scissors, whip out a pair of wire cutters and cut off the ends. 6. 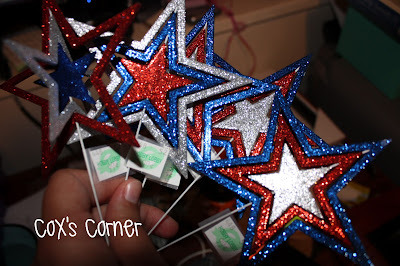 Arrange your stars in a pattern that you like. I have learned that it's good to follow odd numbers. They end up more pleasing to the eye. My momma taught me that one. 7. Once you get the stars how you like them, hot glue those babies on there. 8. Flip your wreath over and hot glue a ribbon loop to the back to hang it up. 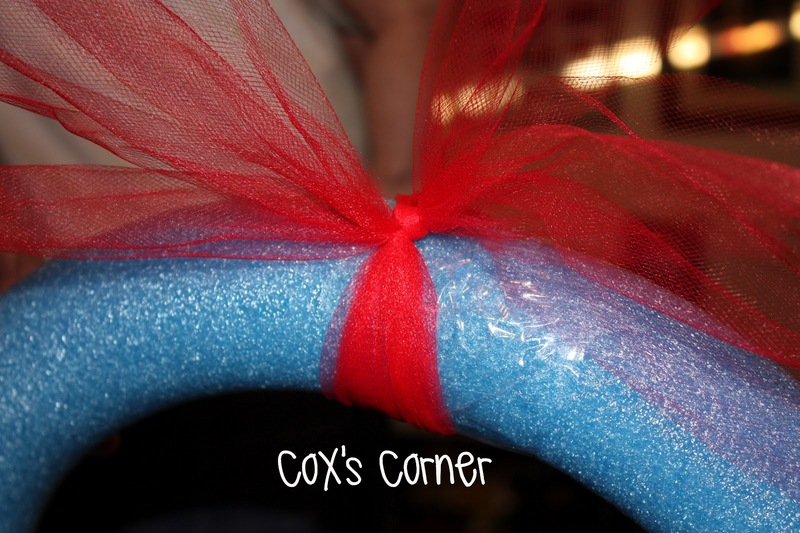 This is was your length will be if you use an 11 inch piece of cardboard to measure your tulle and you use a pool noodle sized wreath form. I went back and cut off a few inches and I like it better, although I find myself wondering how it would look with medium tulle around the edges. I'm still pretty happy with the outcome though! If you like this tutorial, please follow along! I have so many more planned. And if you super like it, pin it to your hearts content! :) Thanks for visiting.